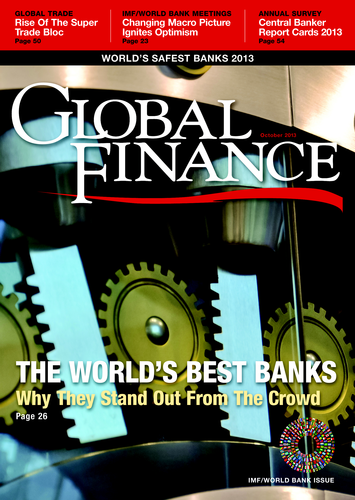 Global Finance presents the World’s Biggest Banks 2013. 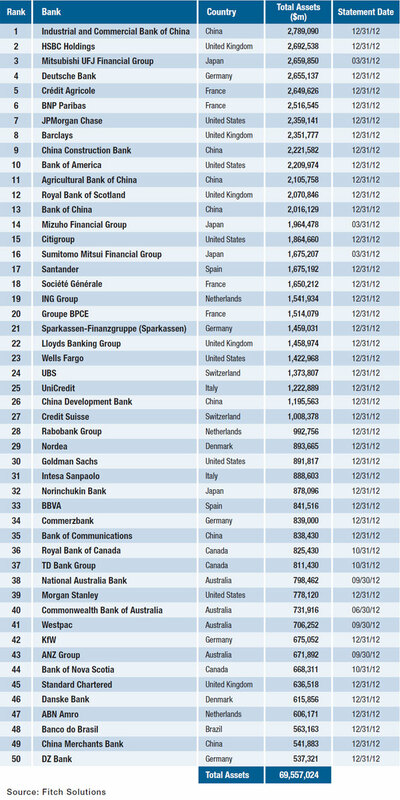 For the first time, a Chinese bank topped the list of the biggest banks in the world at the end of 2012—displacing Deutsche Bank, which led GF’s 2012 rankings, and other global titans such as HSBC, Mitsubishi UFJ Financial, and Crédit Agricole. Industrial and Commercial Bank of China showed assets of $2.8 trillion at the end of the year, an increase of 14% over the previous year. Six other Chinese banks rank in the biggest 50—making China the largest national contingent in the list. All seven Chinese banks showed significant asset growth over the past 12 months. The exchange rate of the renminbi did not change much during 2012, so the increased size of Chinese banks in dollar terms cannot be attributed to exchange rate movements. The US contributed six banks to the list, the UK and Germany five each, Australia, France and Japan four each and Canada and the Netherlands three each. Other countries contributed the remaining nine. Total assets of the biggest 50 banks reached to $69.6 trillion, an increase of 5.5% on last year. The seven Chinese banks accounted for 17% of that total, the largest of any national group. US banks contributed 14%, British banks 13% and French banks 12%. The fiftieth bank on the list is Germany’s DZ Bank, with assets of $537,321 million.